Pictured are: Ron Teel, second, Tim Steckel, champion, and Eddie Hoffman, third. 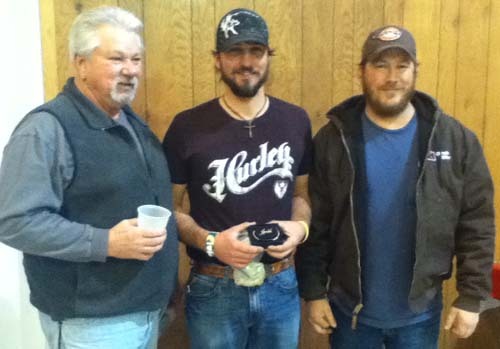 The Dave Olson Memorial Texas Hold ‘Em Tournament was held on Jan. 26 in the Artesian Community Center. A total of 55 players participated in the tournament. Tim Steckel was successful in collecting all the chips in his corner at the end of the evening. Others earning a spot at the final table were Ron Teel, Eddie Hoffman, Bob Schmit, Linda Whitney, Steve Whitney, Jamie Rexwinkel, Jerry Moore, Robert McKillop and Todd Hvam. Ron Teel earned second place and Eddie Hoffman took third place. High hand of the evening was kings full over eights recorded by Daylyn Baysinger. The winner of the 31 game was Diane Grassel. A total of $2,500 was raised at the event. Beneficiaries this year are the Artesian Fire Department and the Sioux Falls Ronald McDonald House. The Ronald McDonald House provides nurturing and affordable housing for children receiving medical treatment and their families. The Ronald McDonald House in Sioux Falls has hosted 19 families from Sanborn County in the past. Congratulations to all who participated in the Knights of Columbus Free Throw Competition held at Sanborn Central on Sunday, Jan. 20. The following 10-14-year-old athletes will advance to the District Competition to be held in DeSmet on Sunday, Feb. 10, back, left to right: Tater Moody, Alex Wormstadt, Trent Kingsbury, Shaun Snedeker, Trevor Olson; front: Katie Schmit, Abby Vermeulen, Maddie Vermeulen, Kayla Olson. 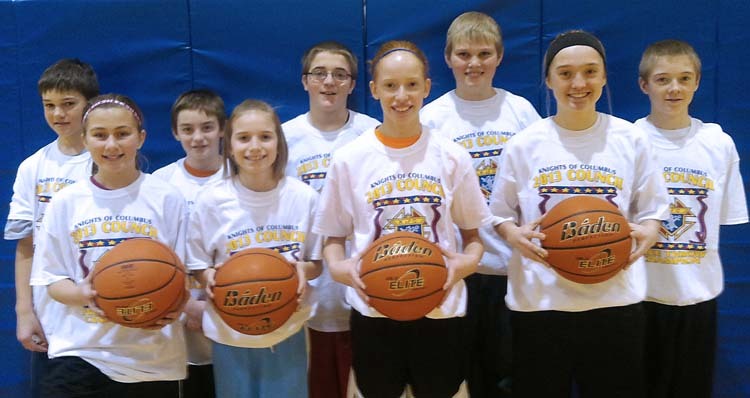 St. Wilfrid Knights of Columbus held their annual Free Throw Contest Sunday, Jan. 6. The following participants won in their division, left to right: Jaedyn Ford, Erica Howard, Trey Weber, Spens Schlicht, Brooklyn Swenson, Tayla Weber, Alyssa Ball, Jessa Fisher. These winners will move on to the District event in February.